"I'm an old hand at spiriting away melancholy young ladies," Lupin opines in the dark, underwater second tower of the episode's title. 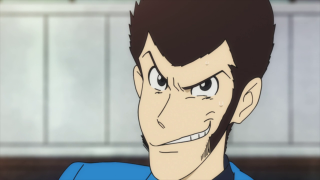 Lupin III the character, and Lupin III the franchise, is never afraid to acknowledge its past. However, unlike it's more desperate attempts to revive its past artificially with bumbled attempts to recapture the old spirit (some of its TV specials), the first episode of this brand new Lupin series nods gently while propelling itself on rocket-powered skis into the future. Or, at the very least, the present, where Lupin and the gang are looking to filch Bitcoins from dark web drug peddlers, because a bank's a bank, a vault's a vault, and let's hack all the blockchains on the clouds, young people! (Nobody said it was a perfect representation.) Something Jigen scoffs at, Goemon is probably entirely ignorant of, but Lupin is a bit excited to try, at least for a lark. 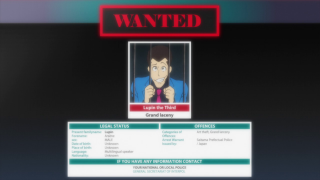 After all, it's a brand new world of identity theft and online debauchery, and Lupin wants in! There's something about Lupin III unwrapping a package of drugs from the mail to check on the veracity of the market that strikes an unusual, but interesting picture. Lupin and the gang are criminals, and have even gone after drugs before, but they're not, you know, drug pusher criminals. It's just weird to see Lupin handle a bag of pills and such he got in the daily mail like they were nutritional supplements. Naturally, he and Jigen throw them away. They only have time for nicotine and alcohol. And gorgeous egg galettes with mushrooms, served lovingly in a side street cafe in France, the latest setting for Lupin's capers. 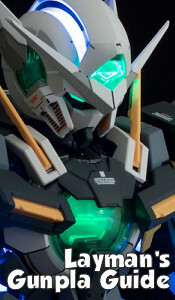 As usual, even the masterfully well-laid plans of Lupin, which include cloaking, skydiving suits, and impersonation are thrown in disarray by the girl living in the basement of the cloud server facility that he's looking to access. Not only does his family act not persuade her, but her access to the network is so masterful, it's like second nature, and he's exposed. Lupin's got a great extraction team in Jigen and Goemon, but it's Ami's interest in casting away the "invisible chains" around her that get him out of this mess... and into a whole new one, as Ami's handlers are none to pleased their golden goose has flown off. There's an interesting element that makes Ami stand apart from some of the typical "feature independent Lupin ladies", or FILLs, which is that her social detachment makes it difficult to pin her down. She wanted to be rescued, but it's not as though she was against the work she was doing. She has abilities that could resolve Lupin's problems, but she doesn't seem interested in using them. She doesn't particularly care about Lupin, but she becomes dependent on him almost immediately. She's the type who if not prompted will forget entirely to eat a meal. She's cute, but she's not "cute". She's not looking to be famous or prove her mettle to Lupin (thus far), she just wanted out of a situation, but it's not as though she's in love with him. She's very different from Rebecca in Part IV, but I've a feeling she'll be a reoccurring character in the same vein, and while different, still interesting. 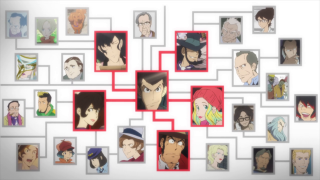 The final compelling plot element of this opening salvo is the Lupin Game, a system designed to unmask Lupin wherever he goes, to track him with the power of all of its users, hypothetically the entire internet. 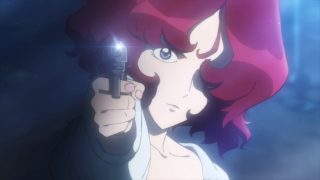 In a way, it's reminiscent of the Eden technology in Eden of the East, but it's hyper focused on a single target (or I guess also his crew) because Lupin inconvenienced the wrong group of nerds. It should add an interesting element to this series, and I hope to see it carry though the entire length of this show, giving Lupin a handicap in whatever escapade he's plotting. It's a wonder this hasn't happened yet. 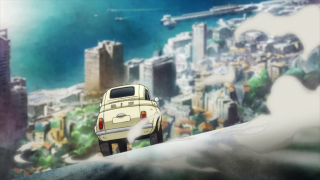 Alas, my friends, but while we've gained a potential new friend, we've lost one, as well, in Lupin's classic tricked out Fiat, lost in an underwater grave after a worthy chase in a strangely sparsely populated city area. It's very likely that this is just one of many of Lupin's such Fiats, but it's a shame to see his yellow buddy sink into oblivion in a desperate gambit to throw the authorities of the group's trail. We all mourn your loss, Lupin. But hey, you also have a Mercedes SSK, right? Sure, it's not very inconspicuous, but everybody knows you now, anyway, so you may as well flaunt it. The visuals aren't much different from the last series, albeit the character designs are a bit more simplified (for movement's sake?). 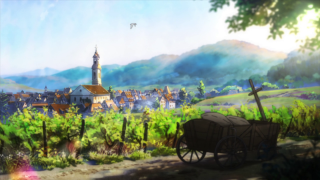 The backgrounds and foregrounds continue to have a painted picture feel, creating a comfortable atmosphere with which to share in the camaraderie of friends. The soundtrack and the voice acting are all on par, as well, and characters naturally play off each other vocally, which makes it a pleasure to hear them in casual conversation when they aren't planning. This time the audience doesn't seem to have to endure two different musical scores, which is a big plus, because it spoiled my enjoyment of the English dub for Part IV. Production values are, overall, in the win column. Now, of course, being a huge Lupin fan, I'm usually looking forward to watching any more of the franchise, but it's been especially pleasing to be a fan of it in recent years, with hit after hit. Let's hope this won't rest on its novelty and the strength of modern Lupin, and forge its own future.